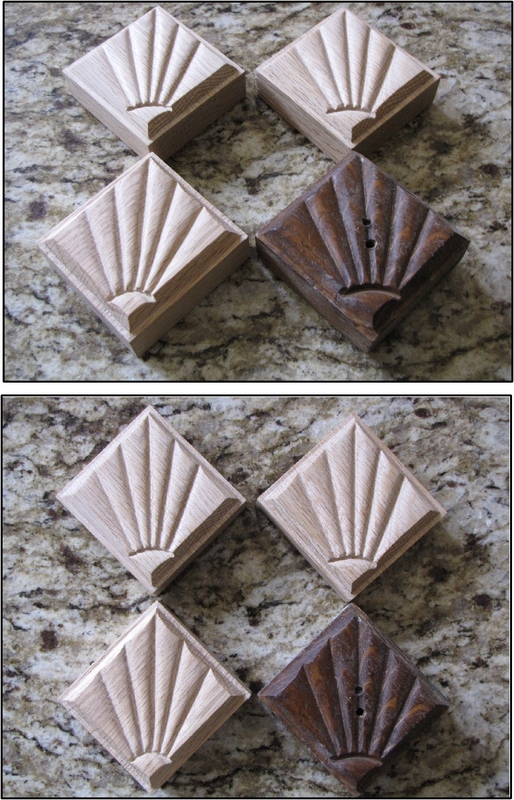 A client provided an oak rosette from a piece of antique furniture, commissioning three identical oak rosettes to match. This is a Cherry box lid that I was commissioned to carve. The box will contain a cherished family bible. The client lives in Pennsylvania and wanted to include Amish hex symbols in the design. He sent me some basic design ideas and after a bit or correspondance we came up with this design. These pictures show the final design and the initial rough out. This commission occurred before a trip to Arizona and I like to carve when I am on vacation. So a cactus was the perfect background for this photo showing the initial phase of hand carving. These are pictures of the completed commission. The client wanted the lid to look slightly "rough", as though a farmer might have carved it over the winter. 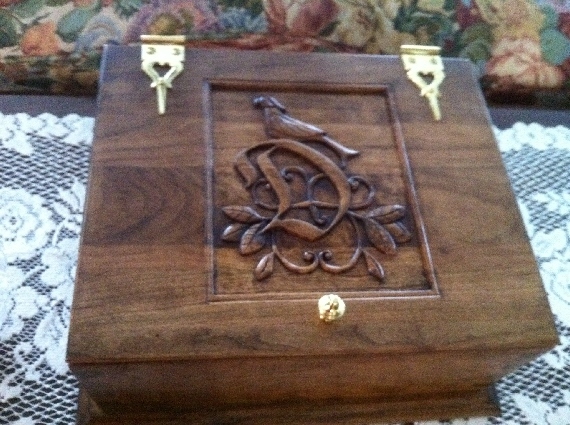 The completed carving met all of the client's expectations and soon should house his family bible. This is a picture of the completed box. I was contacted by a client who asked if I could recreate the missing end of a scroll on an antique curio cabinet that he was try to restore. Having never tackled that type of project I of course said "Of course, I can". 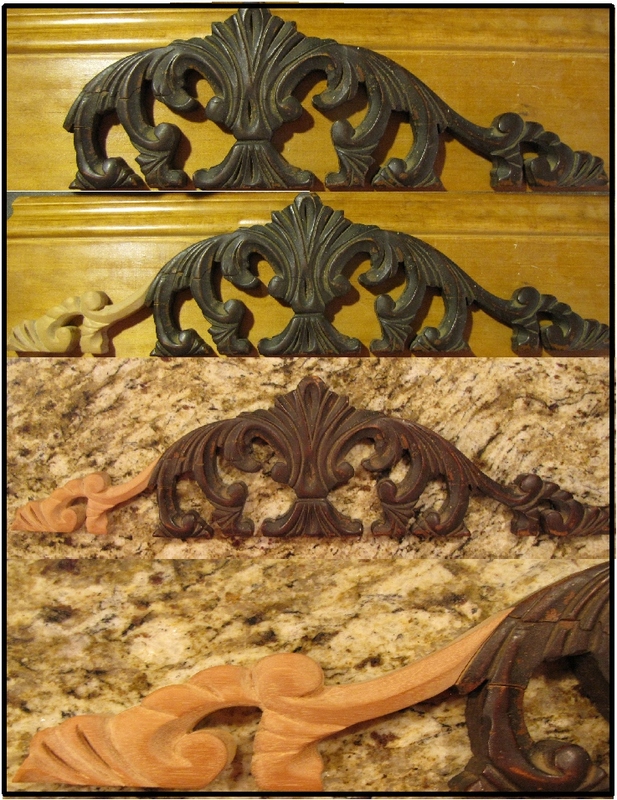 Below is the the carved mahogany addition awaiting finishing by my client. Our dog, Trixie, had a favorite corner in our house -- her little safe haven. For Christmas 2010, I made a corner shelf officially designating Trixie's Corner. Upon her passing, it was the fitting place to put her ashes. The corner shelf is made from Birdseye Maple with Purpleheart inlayed paws. The letters are scroll cut to reveal dyed green Maple letters. Guitar-Stor produces decorative wooden guitar/case stands. These stands hold multiple guitars or cases.